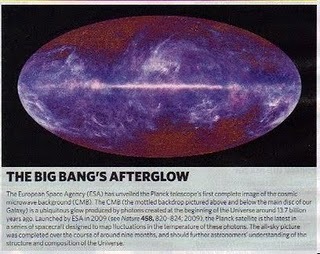 The Image above was taken by the Planck Telescope of the European Space Agency published in Nature, July 8, 2010. The complete Milky Way is the white plate seen on edge. The background radiation of the Big Bang is shown in the bluish surround. At the request of a good friend of mine, I posted it on his blog (The Brotherhood) of a site (http://americanwantssarah.ning.com) that we belong to. The posting drew a lot of comments about how the Big Bang and Evolution (which I did not mention) contradicted creation stories in the Bible. My comments here are partly a reply to some of these criticisms and partly to another friend’s observations on President Obama’s directive to NASA to assure the Muslim community that it had contributed greatly to science and technology. Assuming there was a Big Bang this has nothing to do with God. God being God can do anything He likes except create a contradiction. If He wanted to start us all off with a Bang, that is His business. Many scientists do not believe in God, some do. Darwin to his dying day was a believer and church-goer. The difficulty some religious people contemporaneous with him had was that the Theory of Evolution made impossible a literal belief of the creation verses in the Bible. No good scientist I ever heard of did his science to prove that God does not exist, an impossibility at any event. That would be like devoting oneself to growing sugar cane to show that Ford 150s are the best selling vehicle in America. Science has nothing to do with religion This whole matter was debated and resolved in the Late Medieval Ages during the beginning years of universities, mostly at the University of Paris. There followers of Aristotle clashed with theologians who, too, like some commentators on the blog, believed in the literal truth of the Bible. These clashes in the 12th and 13th Centuries were eventually resolved in the Aristotelians’ favor, as by the 14th Century the Parisian professors had to swear to teach Aristotle and an Islamic commentator on Aristotle, Averroes. [‘Averroes’ is the name used in the west for Ibn Rushed, 1126–1198. He is one of the two Muslim natural philosophers–the title given to scientists then–popularly remembered today, the other being Avicenna, Ibn Sīnā, 980–1037.] At that time (the 14th Century) there was an agreement–still in force–that scientists stuck to the observable (broadly defined) and that theologians were responsible for metaphysics and religion. So the swirl of comment in the 19th Century about Darwin’s science has a history. As to my good Friend M’s comment [about President Obama’s NASA directive], Islam did have a 500 year period of scientific eminence, which was to mostly to preserve Aristotle and Plato and other classic authors for later use in the Renaissances (there were a couple of them). That 500 year period ended in the 15th century. President Obama are you listening? The period of distinction of Islamic science ended in the 15th century. There are 2 major reasons for this: First there is a strong tradition in Islam against abstract learning. Knowledge to be pursued had to be in the practical interest of Islam, and since Islam knows no distinction between religious and civic law, all learning had to contribute in a way that would be epistmologically incompatible to scientific and other endeavors in the west. (What practical effect does acquiring estimations of the size of the proton or of facts about Mozart’s 21st Piano Concerto have?). The second reason for the decline was that the Muslims never established the kind of universities and other types of schools started in the 12th Century (in Bologna), added to in the 13th and following Centuries, and still going on today in non-Muslim societies in which knowledge could be acquired, systematized, preserved, and protected against the depredations of anti-intellectuals. Madrases were and are only theological institutions. For NASA now to devote itself to assuring Muslims that they are just as good at science and technology as are we (which as a society they clearly are not) is as condescending, as is the racism and sexism of affirmative action. What affirmative action does is re-institute Jim Crow and the degradation of women. It intimates that blacks and women are not good enough to compete in a white, manly world. They need a helping hand. (A new version of the white man’s burden.) Grades low? Does not matter, in you go anyway to, say, the Harvard Law School. Not publishing any law review articles once you get there, Barry? Not to worry. We shall make you Editor of the Law Review so you will not feel badly about yourself. Blacks and women not good enough? Oh, yeah? First of all the brightest person I ever knew was a black girlfriend of mine in our freshman year of college. (We were crazy about each other but her family would not let us get together because I was white.) Second, you had better not have let any such talk of the little woman needing some aid from us men around my Mother or her sisters. Any of them would have knocked your block off. The women of AWS [the website in which these comments were initially posted] do not need me to speak for them, but my guess is that, if any of them had heard such talk, she would have elbowed my Mother aside to throw the first punch. Almost two years ago, I wrote a blog about Governor Sarah Palin (see below), then candidate for vice president of the United States. As we all know, Governor Palin and Senator McCain lost their bid for the presidency; however, the media and pubic interest in this unique woman hasn’t waned. Governor Palin’s supporters never lost faith with her after the election, pinning their hopes on another run, perhaps for president, in 2012. Since the election, her detractors continued their tirades and filed baseless ethics complaints (all but one dismissed) while the media seemed unaware that the McCain/Palin ticket failed. Until recently (a year and half after the election) did one notice a decrease in media attacks on the former Governor of Alaska. The insults and assaults on Governor Palin did not sway her support base, in fact, it made the faithful even more steadfast in their devotion and energized the growing ranks of her followers on Facebook, Twitter and hundreds of social networks devoted to her. In brief, Governor Palin emerged from one of the most vicious and unrelenting “scorched earth” strategic political attacks in modern history with her dignity and reputation intact. She boldly criticizes her former political (perhaps future?) foes and opponents using the new media of the day, such as Facebook, and in her new position as a contributor to Fox News Network. If one reads her autobiography, it is clear that Sarah Palin is a formidable adversary, fighter and competitor (not to mention a hunter). Still, after the abuse and lies spread about the governor and her family, one might expect her to step out of the heat of the spotlight and enjoy the royalties rolling in from her best-selling book, “Going Rogue.” Apparently, Sarah Palin has other plans. When Sarah Palin resigned as Governor of Alaska almost a year ago, almost every pundit predicted her political demise and fade from public life — and they could not have been more wrong. Still, it’s not really fair to hold these “experts” accountable for their flawed conjecture; they are used to profiling Washington politicians and Sarah Palin is the proverbial square peg. The former maverick of Wasilla, Alaska is now dubbed the new “King or Queen-maker” of the Republican party. Three out of her four candidates picked for endorsement won in last June’s Super Tuesday primaries: Carly Fiorina: California, US Senate, Nikki Haley: South Carolina, Governor, and former Governor Terry Branstad: Iowa, Governor. She continues to be in demand for endorsements and speaking engagements. “This year will be remembered as the year that common-sense conservative women get things done for our country,” Palin says in the 90-second video. While no name are mentioned in the spot, many wonder if this video, in which Sarah Palin appears polished and, well, presidential, may be a first step toward tossing her hat into the ring for a presidential run in 2012. I first declared myself a feminist at the age of 14. In reality, I knew very little about feminism, but the ideal resonated with my strong sentiments about personal freedom. My activist English teacher discovered my interest in feminism and guided me to books by all of the popular feminist authors of the day. It was a lot for a young girl to absorb and understand. My teacher urged me to join the Student Senate, so that I could endorse her class on activism in our high school. At that time, I didn’t understand her motivation; I was just barely in my teens and still quite naive. Today, my personal definition of feminism is very similar to what I believed in my youth; it simply means that a woman should be able to choose her own life path, work in a profession of her choosing and receive fair and equal compensation. A woman shouldn’t encounter or accept discrimination because of her gender. So, why are feminists and others (still) alarmed by the popularity and respect so many have for Governor Palin? I find it baffling because I view Governor Palin as an example of my definition of a true feminist: she’s smart, savvy, ambitious, courageous and patriotic. She sought the highest office in her state and won. She is a mother, a Christian, a governor, a reformer and the first Republican woman nominated for the Vice Presidency. My point is that she chose her own life path; she’s a mother and has a career. I thought that’s what feminism was all about – to be free, without discrimination, to choose our lifestyles, professions and interests. I believe Sarah Palin is one of the best feminist role models we have in public life. While reading various blogs and message board posts, I am surprised by the comments and slurs by some posters. You don’t have to like her, agree with her or vote for her. You certainly don’t have to accept or even understand my endorsement of Governor Palin on the basis of feminism, politics or qualifications (and, yes, I thought she was very qualified) for the vice presidency. However, a little cool-headed discussion and/or disagreement would be more appropriate in your forums. This Sunday, July 4th, Americans celebrate our nation’s Independence Day. We note the event with fireworks, parades, patriotic displays and in singing our national anthem. 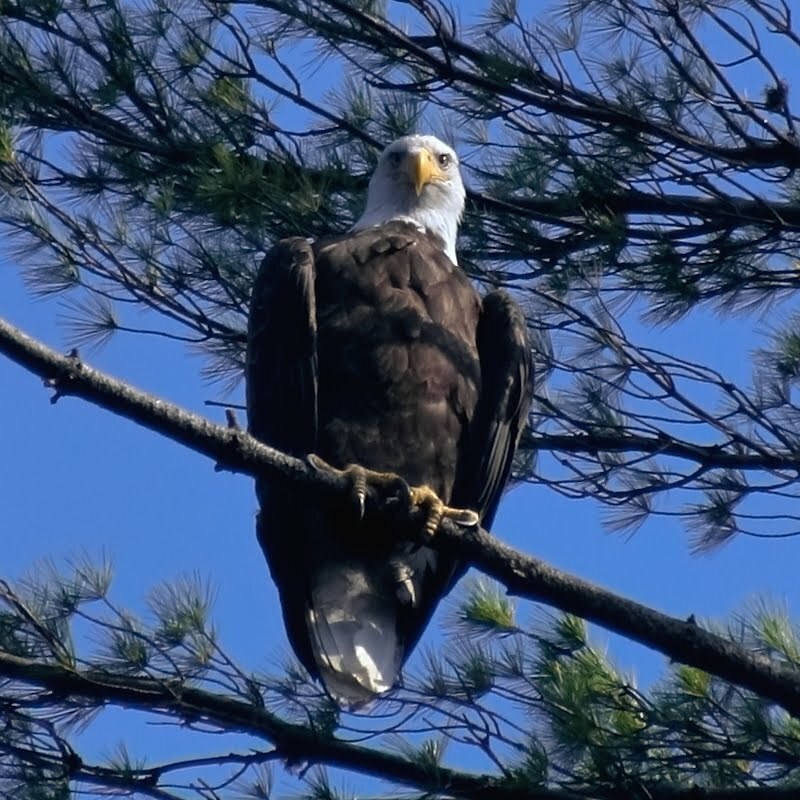 A few days ago, a local news station aired footage of our national bird, the American Bald Eagle (Haliaeetus leucocephalus, meaning “halo” and “head”). Every morning in school, we stood with our hands over our hearts and “pledged allegiance to the flag…” We learned to respect the elements of our citizenship, including the symbols of liberty, such as the American Bald Eagle. “The eagle represents freedom. Living as he does on the tops of lofty mountains, amid the solitary grandeur of Nature, he has unlimited freedom, whether with strong pinions he sweeps into the valleys below, or upward into the boundless spaces beyond. – The shield is composed of thirteen stripes that represent the several states joined into one solid compact, supporting the chief which unites the whole and represents Congress. The stripes are kept closely united by the chief and the chief depends upon that union and the strength resulting from it. – The motto E Pluribus Unum alludes to this union. – The shield is born on the breast of an American Eagle without any other supporters to denote that the United States of America ought to rely on their own virtue. – The olive branch and arrows denote the power of peace and war which is exclusively vested in Congress. – The constellation of thirteen stars denotes a new state taking its place and rank among other sovereign powers. – The pyramid signifies strength and duration. – The Eye over it and the motto Annuit Coeptis allude to the many signal interpositions of providence in favor of the American cause. – The date 1776 underneath is that of the Declaration of Independence and the words Novus Ordo Seclorum under it signify the beginning of the new American Era, which commences from that date. The Escutcheon is composed of the chief and pale, the two most honorable ordinaries. The Pieces, paly, represent the several states all joined in one solid compact entire, supporting a Chief, which unites the whole and represents Congress. The Motto alludes to this union. The pales in the arms are kept closely united by the chief and the Chief depends upon that union and the strength resulting from it for its support, to denote the Confederacy of the United States of America and the preservation of their union through Congress. The colours of the pales are those used in the flag of the United States of America; White signifies purity and innocence, Red, hardiness and valor, and Blue, the colour of the Chief signifies vigilance, perseverance and justice. The Olive branch and arrows denote the power of peace and war which is exclusively vested in Congress. The Constellation denotes a new State taking its place and rank among other sovereign powers. The Escutcheon is born on the breast of an American Eagle without any other supporters to denote that the United States of America ought to rely on their own Virtue. The Bold Pursuit pays tribute to this great American symbol, our Bald Eagle, as he vigilantly watches over our nation from his lofty mountain aerie, just as America oversees the pursuit and protection of liberty at home and abroad. Look upwards, to our banner – an icon of independence presides over The Bold Pursuit. Happy Independence Day … and may God Bless America! My fellow Americans tomorrow marks the one year anniversary of Sarah Palin’s clever transfer of power to Sean Parnell. During this year, despite being instantly dismissed by the “lamestream media,” Americans witnessed the meteoric rise of this new leader to one of Time Magazine’s most influential people in the world. The political power of Sarah Palin is paralleled only by our commander in chief…for now. Through the use of new and alternative media Sarah Palin has become known as America’s Shadow President. The unfiltered internet approach has allowed our Shadow President’s message to directly effect U.S. policy and Washington talking points with less agenda-driven media interference. This weekend America celebrates those who came before us and the sacrifices they made for our freedom. From our soldiers serving over seas to our citizen politicians preparing for Novembers battle; Americans will take the time this weekend to remember those who are fighting to keep us free. America has learned many things this past year. We learned that freedom is never more than one generation away from extinction; we learned that elections have consequences, and most importantly we learned that in America you don’t need a title to make a difference.